We’re pretty lucky to have come from a multi-cultural/multi-religious family and growing up, we celebrated Diwali, Christmas and Eid. (Lots of presents and LOTS of food. And very often, not having to go to school on these days!) 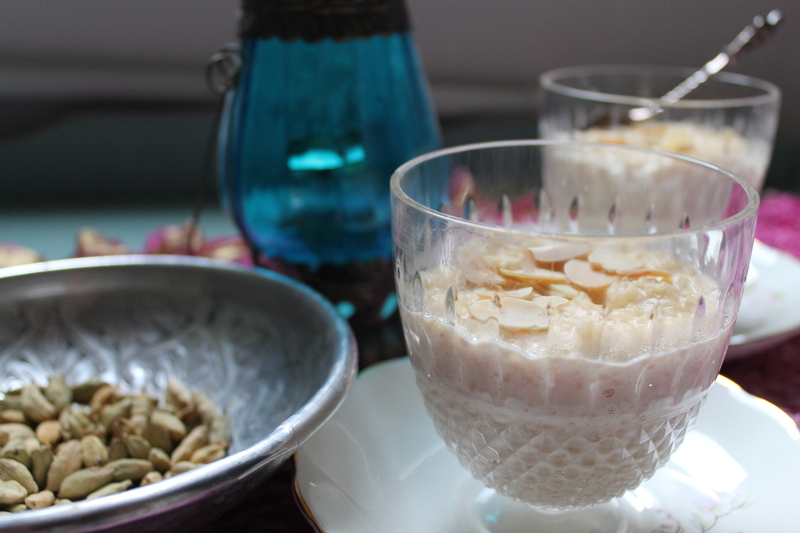 Every (other) Eid, our mother used to make a huge pot of seviyan in the morning – a lovely, sugary milk-based dessert made with vermicelli, sugar, cardamom, ghee, sultanas and nuts, to serve to guests or to take to friends on that day. 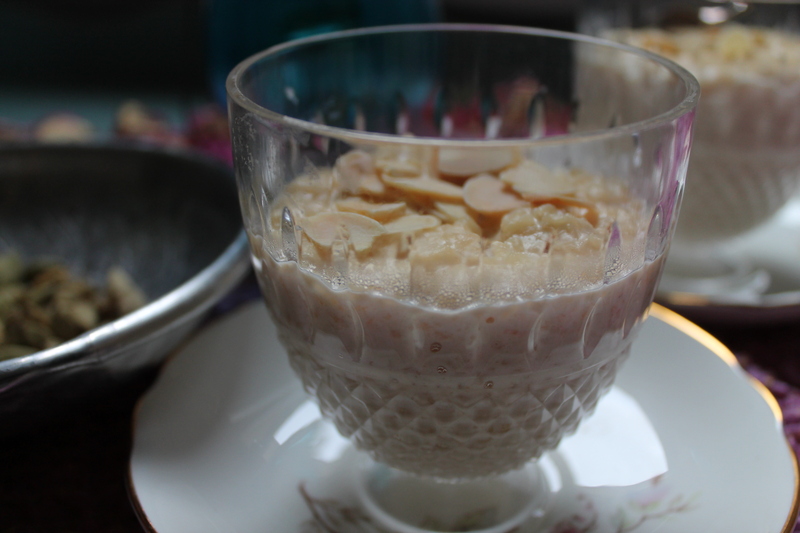 Seviyan is a traditional dessert served in the subcontinent on Eid – in fact, we can’t remember eating it otherwise. If you are Muslim or have any Muslim friends, you might realise that it was recently Eid al-Adha (or Bakr-Eid as it is known in India), which gave us a real hankering for firni, another traditional dessert that is eaten on Eid. 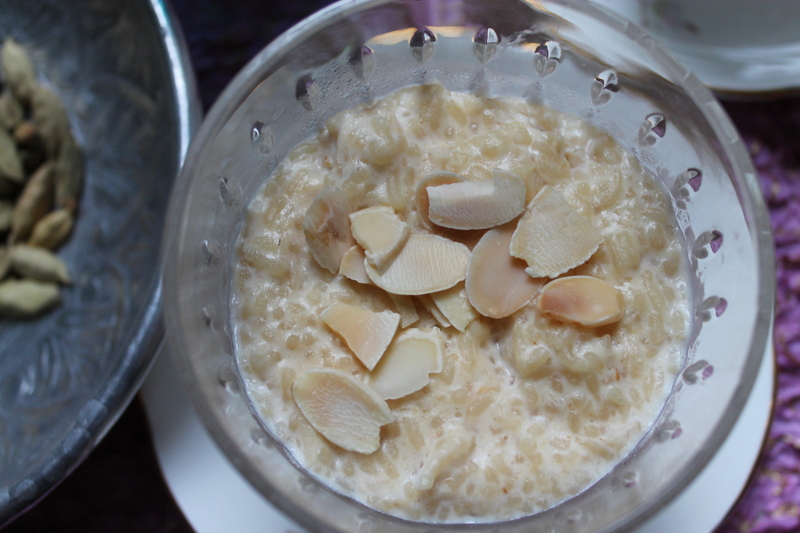 It’s very similar to kheer (Indian rice pudding) but instead uses broken or ground rice. We prefer using broken rice when making this recipe as it gives the dessert a more interesting texture. Ground rice firni feels a bit like baby food! It is also usually served in small, chilled clay pots rather than served piping hot, all-you-can-eat-style. It is therefore perfect for when you need to make a dessert in advance or are REALLY big on portion control. (We’re the latter, since we’re always watching our figures!) It also involves hardly any technique other than stirring and throwing things into the pan – so you have no excuse not to make it today! Eid Mubarak and bon appetit! Heat the milk in a non-stick (VERY important) pan. Bring to boil. Drain the rice and add to the pan. Simmer for 10 minutes or until the rice is cooked. Add the rosewater syrup*, cardamom essence**, sugar and coconut and mix to incorporate. Keep stirring until the firni is reduced by half. (You’re burning calories, yay!) This could take about 20-25 minutes. Spoon the mixture into 2 pretty glasses, clay pots, bowls, etc and top with almonds. Chill in the fridge for a few hours before serving. Otherwise keep in the fridge for 2-3 days. * If you don’t have rosewater syrup, you can either substitute with rosewater or go a step further and make a syrup with sugar, water and a drop or two of rosewater essence. ** If you don’t have cardamom essence, you can easily substitute with 1/2 tsp ground cardamom.